Two new designs with with a bit of a spring like feel. The flip card measures 5" x 5" when folded and the popup box card is 5" x 7" when folded flat. I have to thank my blogging friend Annie for suggesting the flip card. You should check out her blog as she makes amazing cards. You can find the templates here and both cards come with assembly instructions. 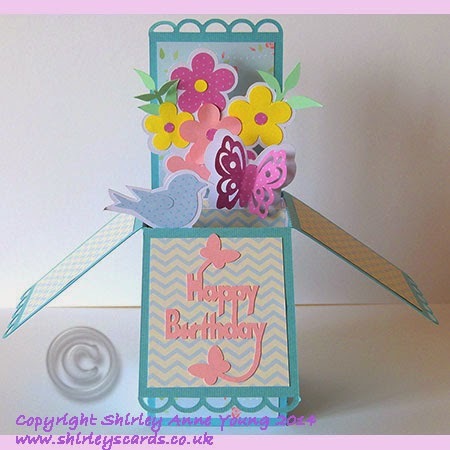 The pop up box is so pretty with it's scallops, flowers butterfly and bird, another GREAT design Shirley. The flip card is clever too, love your birthday frame and flowers.